At Scott Orthodontics, we strive to provide high-quality orthodontic treatment while maintaining a fun, friendly office environment. Dr. Scott and our dedicated team of highly trained orthodontic specialists work to treat every patient on an individual level, designing personalized treatment plans that perfectly suit each patient's unique orthodontic lifestyle. While most of our patients are adolescents, we serve patients of all ages - and a growing number of those patients are adults seeking to transform their smiles and reinvigorate their lives. While the majority of our patients are teenagers correcting their smile for the first time, more and more adults are discovering the magic of orthodontic treatment. In fact, more than a quarter of our patients are adults! It turns out that while some may think of braces as "just for kids," we can move healthy teeth at any age - so you're never "too old" for braces. And considering all the benefits of a new smile, it's little wonder why so many adults are seeking to reinvigorate their lives with orthodontic treatment. In addition to the obvious aesthetic improvements, a new smile comes with a variety of other benefits. Straighter teeth are easier to clean, which means correcting your smile can help safeguard the health of your teeth by preventing problems like dental decay and gum disease. Some studies have even linked oral bacterial infections to cardiovascular problems, so you may also be helping your whole body health with a new smile. But the real benefits of an improved smile are psychological. A new smile brings a boost of happiness, confidence, and self-esteem that radiates through every area of your personal and professional life. Imagine how much easier that neighborhood block party, big presentation at work, or first date would be if you had a smile you were proud to show off - and with modern orthodontic treatments, that new smile is closer than you think. 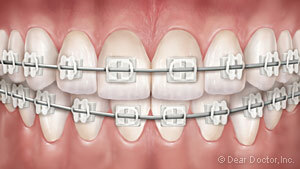 This is what comes to mind when most people think of "braces." 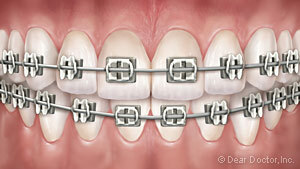 Composed of high-grade stainless steel, traditional braces use small brackets cemented to the front of teeth and a thin, springy archwire running through the brackets to move teeth. Clear braces use the same basic principle as metal braces, but instead of stainless steel, the brackets are made from a transparent ceramic composite material. This means the brackets blend in perfectly with teeth, making them far less noticeable than traditional braces – but they're also more fragile than traditional braces. Invisalign clear aligners do away with brackets and wires entirely, instead using a series of clear, removable plastic trays called aligners to straighten teeth. They're virtually invisible when worn and easy to pop in and out for eating, drinking, brushing, and flossing. This means no one has to know you're straightening your teeth, you can still enjoy all your favorite foods, and maintaining oral hygiene is as easy as ever. After the active phase of treatment, we'll remove your braces - but it's critical that you wear a retainer to safeguard your smile. While your teeth are in new positions after treatment, the underlying bones, tissues, and ligaments supporting them have yet to "set" into place, so without a retainer, your teeth will just move back to their original positions and erase all your hard work! To prevent this, we'll fit you with your own custom-made retainer and give you detailed instructions for wearing and caring for it. 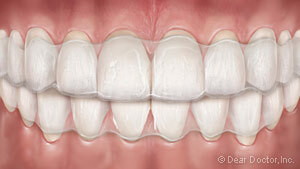 With diligent care, your new smile is yours for the rest of your life! Adult orthodontic treatment is a great way to refresh your smile and reinvigorate your life, and if you'd like to find out more about how orthodontic treatment can help you, we'd love to speak with you. Feel free to call us at (301) 589-8191 for our Silver Spring office or (301) 390-1510 for our Mitchellville office, reach out to us at our contact page, or request an appointment online and one of our team members will contact you shortly. We can't wait to hear from you, and we're excited to help you experience all the benefits of a beautiful, healthy new smile!